What are Catalog aware item types? 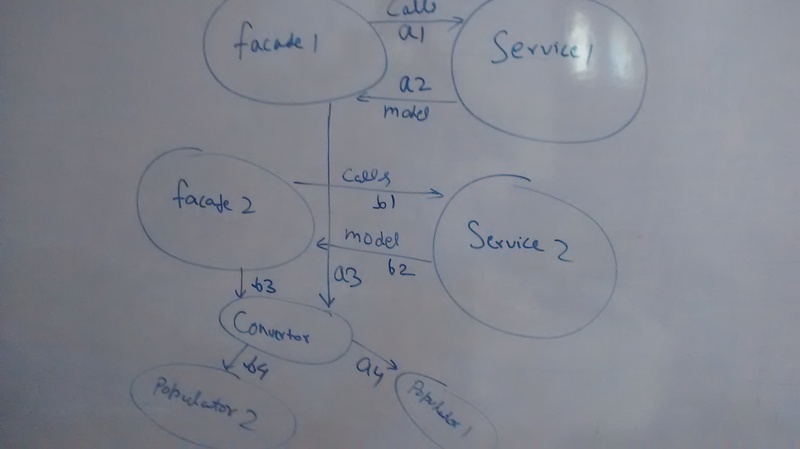 While creating a data model for your project, you might come across situations, where you might want some of your item types to be part of catalog. This means, you want them to synchronize, you want them to be associated with a catalog, content or product. Such item types are known as catalog aware. It’s not just CMS item types or products, that needs synchronization. All OOB CMS items and products are catalog aware. Mark your item as catalog item type, using custom property catalogItemType. Choose attribute from item, which will qualify the catalog associated using custom property catalogVersionAttributeQualifier. Since each item in a catalog must be unique, we need to choose an attribute from item which is unique. This can be done using custom property uniqueKeyAttributeQualifier. Once updating your item type, you should update your platform, using system update. Now, instances of this itemtype will be catalog aware, and would be part of synchronization. What does partOf modifier means? In my school, IT department had 5 professors, who taught different subjects of computer science. School used to manage departments, and professor used to teach. They had their own work life cycles. Everything was so good. But then, school decided to close the department. The professors were bound to loose their jobs. Since they were part of the department. That’s how life is. When your object is bound to loose it’s existence, when the parent object cease to exist, we say that, child object must have an partOf modifier attached. For example, An address object is useless, until it is bound to some User object. Have you heard of cascade-delete in SQL. It describe the same phenomenon. Why we have converters and populators in hybris? I can convert my models to DTO directly in facade layer. Then why should i have a converter? Its Simple. We may need to convert a product (model) from multiple places. We convert it on product listing page, product detail page, order confirmation page etc. Hybris follows oops concept..So it is good to have a separate class to do this conversion for us, from all of these places. Converters creates an object of DTO. While populators breaks the code for filling up data in DTO. This is required because, not each DTO needs all attributes of a model. Thus by having multiple populators, we can write more efficient code. Reverse populators are used to fill data in model from DTOs. The image shows two paths followed (a and b) by two different facades using same converter and different poplators. We should always use spring injected converters and populators. What are different kind of property files in Hybris. Hybris provides a flexible way to manage properties for your project. You can configure as many as properties as you want in your project. project. properties : This is actually a extension level property file. The properties defined here are available only for the extension, it belongs to. You should define the properties, which are to be used only in this extension. Hybris provides a property file for each extension by default. The value for a given property is based on the experience and convenience. For example, the URL for HAC. Local.properties : We have another file called local.properties. This is available per tenant for the overall application. This file is used to define modify the values given in extension specific project.properties file. So it will basically overrides the project.properties file value. For example, we can give, database connectivity parameters in this file. We should always use local.property file to customize the behavior of hybris. As any migration or upgrade will not effect, the values to go to default ones. We also have localization property files, to manage the internationalization of project. We need to restart the server to make an effect of change in any property value. Build is not necessary. We can use the properties even in spring managed beans. We can pass them as a property of a bean. Hybris comes with bundled Log4J logger. This is used for every logging activity in hybris. So every logging activity for subpackage will be run twice, once for parent package and one for sub package. To get emails from hybris in local set up is something, we can not avoid. But not everybody has SMTP servers, so they are bound to use, some open source smtp servers, like that of gmail. But google often blocks any attempt to sign in from any application (hybris), if it doesn’t know it. Basically this is a security feature from google. They don’t want a bad guy to access your account. 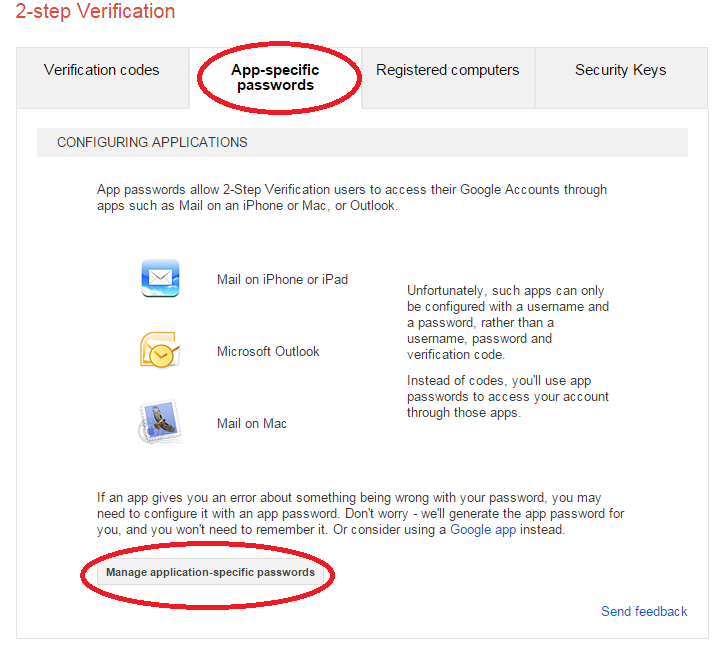 First, you need to set up the google account you are using, for a 2 step verification. 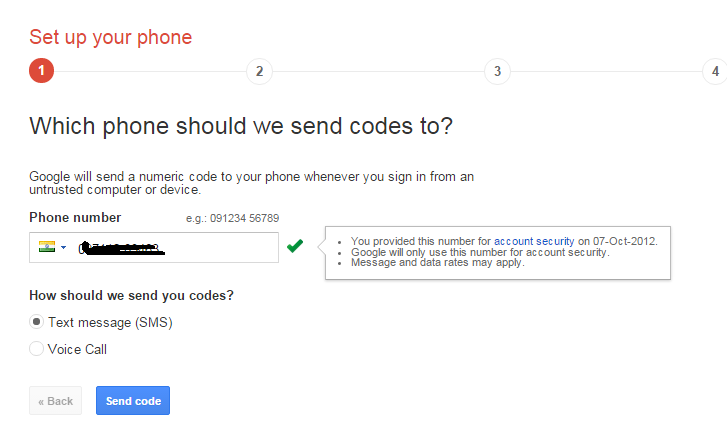 Once you click on get started, it will ask you for mobile number authentication using sms. proceed to next stpes, after verification. After clicking confirm on next screen, go to App specific password tab. 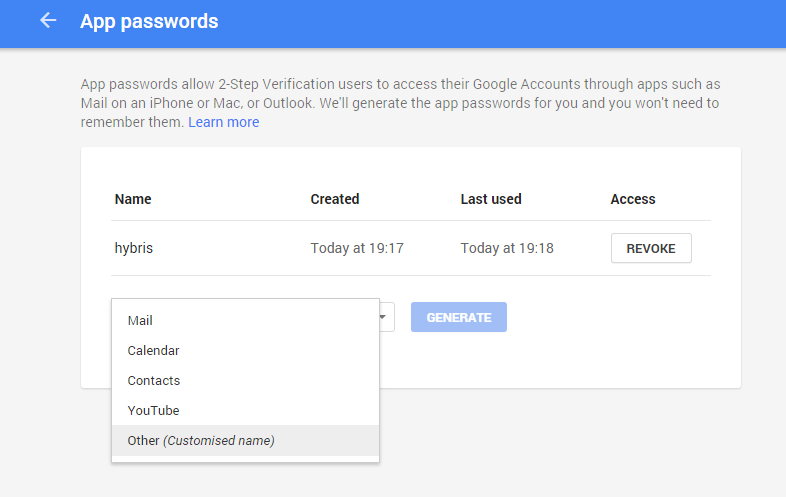 Generate a password for a custom application. This will give you a 16 digit password, for your application. 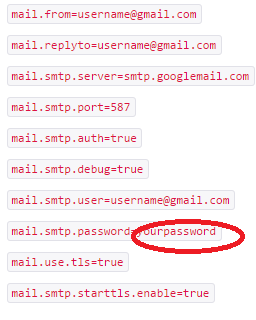 You need to use this password in your smtp settings. You can configure below proerties in local.properties file. Now your email should work. You can test your email setting by sending a test email from HMC.